Flavors are intended for adding taste and aroma to food products and for enhancing the taste and aroma the product already has. Flavors are added to food products in such quantities so that the content of flavoring substances would approximately correspond to their proportion in respective unprocessed products. If such quantities are noticeably increased the organoleptic properties of a food product worsen and the product’s quality is being lost. It is prohibited to use flavors to mask the food products’ aroma change due to their spoilage or poor quality of raw materials. Vanillin is a flavor, taste and aroma enhancer. 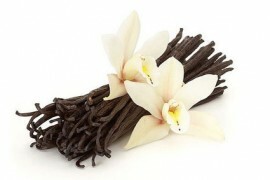 Vanillin’s molecules correspond to the natural vanilla’s formula, therefore vanillin is a nature-identical aromatic substance. Vanillin is much cheaper than natural vanilla.